Plot: A war-hardened Crusader and his Moorish commander mount an audacious revolt against the corrupt English crown in a thrilling action-adventure packed with gritty battlefield exploits, mind-blowing fight choreography, and a timeless romance. Starring: Taron Egerton, Ben Mendelsohn, Jamie Dornan, Paul Anderson. 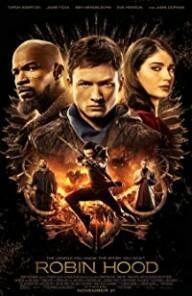 distributed by Lionsgate/Summit «Robin Hood» in the US movie theaters released on November 21, 2018; dvd and blu-ray release date was set for February 19, 2019. Rent from Netflix and Redbox from February 19, 2019. «Robin Hood» in the UK released in movie theaters on November 21, 2018. The movie released on dvd and blu-ray on March 25, 2019.